Restores rich natural sheen to color to your seats and trim! 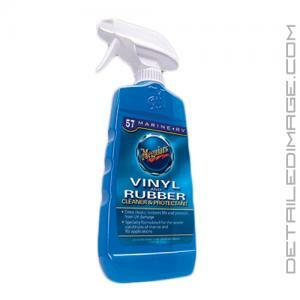 The Meguiar's Marine/RV Vinyl & Rubber Cleaner Protectant 57 cleans, revitalizes, and protects your vinyl and rubber surfaces! Boats are meant to be fun and aesthetically pleasing so keep your boat looking it's best year round with Meguiar's #57! This unique cleaning formula will remove dust, dirt and oils from your vinyl and rubber surfaces, that may be trapped or embedded. After cleaning it will also revive the original color of the rubber and vinyl, bringing it back to life! The high quality moisturizing agents will protect these surfaces from becoming dry and brittle so you enjoy them for years to come. Apply it to your seats, trim, moldings, and more, just spray it on wipe away excess product. #57 will screen out damaging UV rays that can dry out or crack the surface in the future. If you are looking to clean, revitalize, and protect in one easy step, the Meguiar's Marine/RV Vinyl & Rubber Cleaner Protectant 57 is a great choice. Specially formulated for the severe conditions of marine and RV applications. The formula for No.57 Vinyl & Rubber Cleaner and Protectant is made with a premium, complex blend of ingredients to clean, shine and protect. It does all this without leaving a greasy or artificial plastic look. The conditioners help prevent surfaces from drying, fading of cracking, UV protection will reduce damage caused by the sun. liked it so much I bought 2 more. I really appreciate you guys!! I get all of my high end stuff from you. Excellent customer service and great selection.